A 70-year-old woman with a history of known coronary artery disease presented for off-pump coronary artery bypass grafting (OPCAB) for unstable angina. The patient had known coronary disease with a right coronary artery (RCA) stent placed one year before presentation. Pre-operative catheterization revealed 90% left main ostial stenosis with multivessel disease. Preoperative echocardiography was not performed. 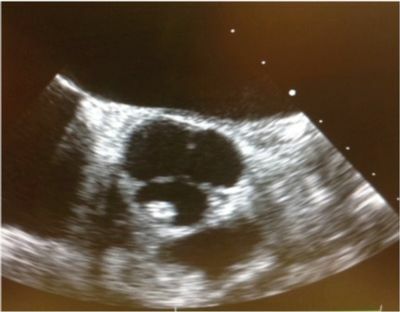 After induction of anesthesia, intraoperative transesophageal echocardiography (TEE) revealed a fixed hyperechoic round lesion with echolucent center measuring 0.7cm in diameter in the proximal ascending aorta in the sinus of valsalva. The lesion was seen in both the midesophageal short axis (figure 1) and midesophageal long axis (figure 2) views. The mass caused a mild decrease in right coronary cusp excursion. 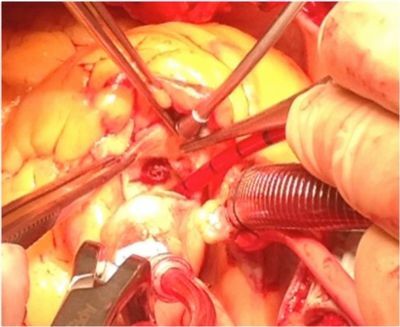 Without a clear diagnosis of the mass, a decision was made by the anesthesia and surgical team to perform the bypass grafting under cardiopulmonary bypass to facilitate exploration of the aorta. Aortotomy revealed a tissue-covered mass protruding 3-4mm from the RCA ostium (figure 3). The mass was identified as a protruding coronary stent and was subsequently dissected from the ostium and removed (figure 4). The patient then underwent a successful 3-vessel CABG revascularization. This report describes a rare echo finding discovered during a planned OPCAB procedure resulting in a change in surgical procedure. Differential diagnosis included fibroelastoma, lipoma, vegetation, thrombus, artifact and calcification. Although this finding has been reported in the distant past by Lerner et al, we believe the incidence of presentation during perioperative TEE will become more common as interventional cardiology procedures become more aggressive. 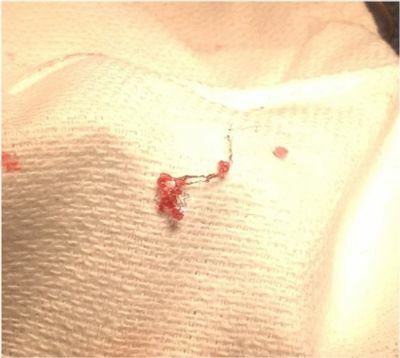 Once difficult and untreatable ostial lesions are becoming more common in the interventional cardiologist’s workplace. It is not uncommon for a cardiologist to overlap multiple stents or use oversized balloons during deployment. These techniques although useful, can impart significant strain on proximal stents making them more likely to have mechanical failure and malposition. Protruding ostial stents pose multiple risks to patients. Although rare, intra-aortic protrusion of a stent has led to acute perforation of a coronary cusp, severe aortic insufficiency and pulmonary edema. Furthermore, stents protruding into the aorta are under increased strain and more likely to fracture and embolize. Fracture of ostial stents with peripheral embolization can cause limb ischemia. Another serious complication of protruding stent fracture is embolism into the carotid artery or cerebral circulation. The routine use of TEE in OPCAB procedures is sporadic secondary to frequent surgical manipulation of the heart which may render inadequate imaging planes. 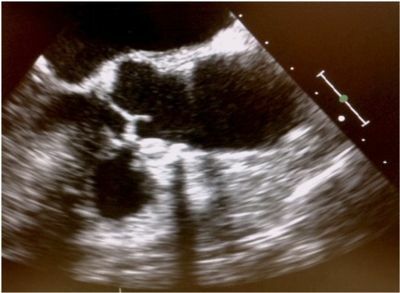 The echo findings in this case highlight an unusual sight to echocardiographers and is another example supporting the use of TEE in even routine OPCAB procedures.